Aug 11, 2014 - The in situ stress tensor in sedimentary basins can be identified using ... Summary of the maximum horizontal stress orientations as inter- ...... Image logs are the principle tool for identifying fractures in the subsurface, as they . Jul 11, 1990 - [14C]benzene and [14C]toluene were not significantly respired after 3 months of ... or alternatively if the JP-4 in the heart of the plume was toxic. organisms in the environment â a review ..... In only one stage is re-circulating particle-free air ... remarkable system is the âFree Wing Impactorâ (Jaenicke and ...... Cho S-H, Seo S-C, Schmechel D, Grinshpun SA, Reponen T (2005) Aerody-. CROP SCIENCE, VOL. 22, JANUARY-FEBRUARY 1982. Table 2. Nodule distribution within the soil profile from Varna, NY, 1979. Nodule distribution depth, cm. APPLIED AND ENVIRONMENTAL MICROBIOLOGY, Jan. 2003, p. 644–648 0099-2240/03/$08.00⫹0 DOI: 10.1128/AEM.69.1.644–648.2003 Copyright © 2003, American Society for Microbiology. All Rights Reserved. The distribution of microorganisms in the subsurfaces of hydrothermal vents was investigated by using subvent rock core samples. Microbial cells and ATP were detected from cores taken at depths of less than 99.4 and 44.8 m below the seafloor (mbsf), respectively. Cores from various depths were incubated anaerobically with a heterotrophic medium. Growth at 60 and 90°C was ascribed to a Geobacillus sp. in the 448.6- to 99.4-mbsf cores and a Deinococcus sp. in the 64.8- to 128.9-mbsf cores, respectively, based on the 16S ribosomal DNA analysis. a The cotton swab that wiped the inside of the core liner and the laboratory atmosphere were used as positive and negative controls for PFC determination, respectively. b ND, not detected. FIG. 1. Depth profiles of total cell counts (circles) and ATP concentrations (triangles) in rock core samples recovered from holes 1188A (filled symbols) and 1188F (open symbols) (A) and holes 1189A (filled symbols) and 1189B (open symbols) (B). FIG. 2. Epifluorescence photomicrographs of DAPI-stained cells cultured at 60°C from the rock from 99.4 mbsf in hole 1189B (A) and cultured at 90°C from the rock from 118.1 mbsf in hole 1189B (B). Scale bars, 40 ␮m. from 69.1, 87.9, and 106.8 mbsf (hole 1188A), 68.4 and 106.9 mbsf (hole1189A), and 99.4, 118.1, and 128.9 mbsf (hole 1189B) (Fig. 2B). Again, no microbial growth was found with the rocks from shallower and deeper zones. FIG. 3. Phylogenetic positions based on 1,489 nucleotides of 16S rDNA sequences of the monospecific bacterial populations grown in anaerobic 60 and 90°C cultures. The tree topography and evolutionary distances were determined by the neighbor-joining method. Values at the nodes indicate the cluster probabilities (percentages) after 1,000 bootstrap trials. oil field subsurface (16, 17, 19) and hydrothermal vents (2). Most Geobacillus species are known to grow in a thermophilic temperature range from 45 to ⬎70°C, and some species are known to proliferate anaerobically (3, 28). On the other hand, OTUs from the 90°C cultures were most closely related to Deinococcus geothermalis, with 95 to 96% nucleotide homology (Fig. 3). An isolate of D. geothermalis from a hot spring has the optimum and maximum growth temperatures of 48 to 50 and 55°C, respectively (9). The 16S rDNA sequences of the genus Deinococcus have been recovered from 1,500- to 2,000-m deep hot springs in Iceland, where temperatures range from 76 to 91.4°C. The Icelandic 16S rDNA sequences show 99% homology to D. geothermalis sequences (13). Deinococcus species were previously described as strictly aerobic; however, certain Deinococcus strains grow anaerobically at 65°C (13). Deinococcus radiodurans is known for anaerobic reduction of Fe(III), Cr(VI), U(VI), and Tc(VII) (10), challenging the view of Deinococcus as aerobic. Therefore, detection of the Deinococcus 16S rDNA in anaerobic 90°C cultures in this study does not necessarily overthrow the opposing view. Unfortunately, both Geobacillus and Deinococcus strains were lost during subculturing. It is known that certain extremophilic species require unique conditions or agents that occur in extreme environments, and it is often difficult to establish persistent culture collections (26). Archaeal 16S rDNA was not detected in the 60 and 90°C cultures by PCR despite repeated trials using common archaeal primer sets (6). This simply means that archaeal species were not recovered from the rock core samples and does not deny the possibility of the existence of archaeal populations, particularly hyperthermophiles, in the subvent habitat. No attempt was made to extract DNA directly from the core interiors, because a limited DNA yield from less than a few grams of rocks was expected. Further enrichment cultures with a wide range of media and conditions will allow the recovery of archaeal and other bacterial species. We are grateful to the JOIDES Resolution crew and scientists on the cruise of leg 193 and the curator of the ODP for obtaining and sharing samples and data of this leg. This work was partly supported by the Special Coordination Fund “Archaean Park Project” of the Ministry of Education, Culture, Sports, Science and Technology (MEXT) of Japan; a grant-in-aid for scientific research from the MEXT (no. 11204205 to H. Yasuda, Kochi University, Kochi, Japan), and the Collaborative Research Fund program “Strategy for Life under Extreme Conditions” of the Graduate University for Advanced Studies, Hayama, Japan. REFERENCES 1. Baross, J. A. 1995. Isolation, growth, and maintenance of hyperthermophiles, p. 15–23. In F. T. Robb and A. R. Place (ed. ), Archaea: a laboratory manual. Thermophiles. Cold Spring Harbor Laboratory Press, Plainview, N.Y. 2. Caccamo, D., C. Gugliandolo, E. Stackebrandt, and T. L. Maugeri. 2000. Bacillus vulcani sp. 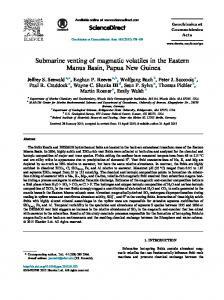 nov., a novel thermophilic species isolated from a shallow marine hydrothermal vent. Int. J. Syst. Evol. Microbiol. 50:2009–2012. 3. Claus, D., and R. C. W. Berkeley. 1986. Genus Bacillus Cohn 1872, 174AL, p. 1105–1139. In P. H. A. Sneath, N. S. Mair, M. E. Sharpe, and J. G. Holt (ed. ), Bergey’s manual of systematic bacteriology, vol. 2. Williams & Wilkins, Baltimore, Md. 4. Cragg, B. A., and R. J. Parkes. 1994. Bacterial profiles in hydrothermally active deep sediment layers from Middle Valley (NE Pacific) sites 857 and 858. Proc. Ocean Drill. Prog. Sci. Results 139:509–516. 5. Cragg, B. A., M. Summit, and R. J. Parkes. 2000. Bacterial profiles in a sulfide mound (site 1035) and an area of active fluid venting (site 1036) in hot hydrothermal sediments from Middle Valley (northwest Pacific). Proc. Ocean Drill. Prog. Sci. Results 169:1–18. [Online.] http://www.odp.tamu.edu/ publications/169_SR/VOLUME/CHAPTERS/SR169_02.PDF. 6. DeLong, E. F. 1992. Archaea in coastal marine environments. Proc. Natl. Acad. Sci. USA 89:5685–5689. 7. Egeberg, P. K. 2000. Adenosine 5⬘-triphosphate (ATP) as a proxy for bacteria numbers in deep-sea sediments and correlation with geochemical parameters (site 994). Proc. Ocean Drill. Prog. Sci. Results 164:393–398. 8. Elsaied, H., H. Kimura, and T. Naganuma. 2002. Molecular characterization and endosymbiotic localization of the gene encoding D-ribulose 1,5-bisphosphate carboxylase-oxygenase (RuBisCO) form II in the deep-sea vestimentiferan trophosome. 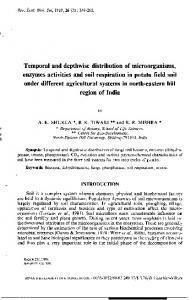 Microbiology 148:1947–1957. 9. Ferreira, A. C., M. F. Nobre, F. A. Rainey, M. T. Silva, R. Wait, J. Burghardt, A. P. Chung, and M. S. da Costa. 1997. Deinococcus geothermalis sp. nov. and Deinococcus murrayi sp. nov., two extremely radiation-resistant and slightly thermophilic species from hot springs. Int. J. Syst. Bacteriol. 47:939–947. 10. Fredrickson, J. K., H. M. Kostandarithes, S. W. Li, A. E. Plymale, and M. J. Daly. 2000. Reduction of Fe(III), Cr(VI), U(VI), and Tc(VII) by Deinococcus radiodurans R1. Appl. Environ. Microbiol. 66:2006–2011. 11. Jeanthon, C. 2000. Molecular ecology of hydrothermal vent microbial communities Antonie Leeuwenhoek 77:117–133. 12. Karl, D. M. 1980. Cellular nucleotide measurements and applications in microbial ecology. Microbiol. Rev. 44:739–796. 13. Marteinsson, V. T., S. Hauksdo ´ttir, C. F. V. Hobel, H. Kristmannsdo ´ttir, G. O. Hreggvidsson, and J. K. Kristja ´nsson. 2001. Phylogenetic diversity analysis of subterranean hot springs in Iceland. Appl. Environ. Microbiol. 67:4242–4248. APPL. ENVIRON. MICROBIOL. 14. Moyer, C. L., F. C. Dobbs, and D. M. Karl. 1995. Phylogenetic diversity of the bacterial community from a microbial mat at an active, hydrothermal vent system, Loihi Seamount, Hawaii. Appl. Environ. Microbiol. 61:1555– 1562. 15. Moyer, C. L., J. M. Tiedje, F. C. Dobbs, and D. M. Karl. 1998. Diversity of deep-sea hydrothermal vent Archaea from Loihi Seamount, Hawaii. DeepSea Res. Part II 45:303–317. 16. Nazina, T. N., A. E. Ivanova, and A. V. Blagov. 1992. Microbiological characteristics of oil fields of Mangyshlak peninsula. Microbiology 61:216–221. 17. Nazina, T. N., A. E. Ivanova, I. A. Borzenkov, S. S. Belyaev, and M. V. Ivanov. 1995. Occurrence and geochemical activity of microorganisms in high-temperature water-flooded oil fields of Kazakhstan and Western Siberia. Geomicrobiol. J. 13:181–192. 18. Nazina, T. N., T. P. Tourova, A. B. Poltaraus, E. V. Novikova, A. A. Grigoryan, A. E. Ivanova, A. M. Lysenko, V. V. Petrunyaka, G. A. Osipov, S. S. Belyaev, and M. V. Ivanov. 2001. 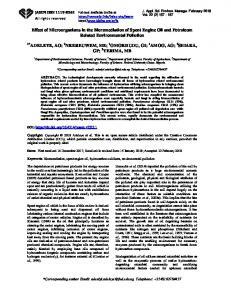 Taxonomic study of aerobic thermophilic bacilli: descriptions of Geobacillus subterraneus gen. nov., sp. nov., and Geobacillus uzenensis sp. nov. from petroleum reservoirs and transfer of Bacillus stearothermophilus, Bacillus thermocatenulatus, Bacillus thermoleovorans, Bacillus kaustophilus, Bacillus thermoglucosidasius and Bacillus thermodenitrificans to Geobacillus as the new combinations G. stearothermophilus, G. thermocatenulatus, G. thermoleovorans, G. kaustophilus, G. thermoglucosidasius, and G. thermodenitrificans. Int. J. Syst. Evol. Microbiol. 50:1331–1337. 19. Nazina, T. N., T. P. Tourova, A. B. Poltaraus, E. V. Novikova, A. E. Ivanova, A. A. Grigoryan, A. M. Lysenko, and S. S. Belyaev. 2000. Physiological and phylogenetic diversity of thermophilic spore-forming hydrocarbon-oxidizing bacteria from oil fields. Microbiology 69:96–102. 20. Noble, R. T., and J. A. Fuhrman. 1998. Use of SYBR Green I for rapid epifluorescence counts of marine viruses and bacteria. Aquat. Microb. Ecol. 14:113–118. 21. 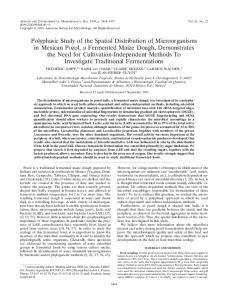 Reysenbach, A.-L., D. Go ¨tz, and D. Yernool. 2002. Microbial diversity of marine and terrestrial thermal springs, p. 345–421. In J. T. Staley and A.-L. Resysenbach (ed. ), Biodiversity of microbial life. Foundation of Earth’s biosphere. Wiley-Liss, Inc., New York, N.Y. 22. Reysenbach, A.-L., N. G. Holm, K. Hershberger, D. Prieur, and C. Jeanthon. 1998. In search of a subsurface biosphere at a slow-spreading ridge. Proc. Ocean Drill. Prog. Sci. Results 158:355–360. 23. Reysenbach, A.-L., K. Longnecker, and J. Kirshtein. 2000. Novel bacterial and archaeal lineages from an in situ growth chamber deployed at a MidAtlantic Ridge hydrothermal vent. Appl. Environ. Microbiol. 66:3798–3806. 24. Smith, D. C., A. J. Spivack, M. R. Fisk, S. A. Haveman, H. Staudigel, and the Leg 185 Shipboard Scientific Party. 2000. Methods for quantifying potential microbial contamination during deep ocean coring. Ocean Drill. Prog. Tech. Note 28. [Online.] http://www-odp.tamu.edu/publications/tnotes/tn28/INDEX.HTM. 25. Smith, D. C., A. J. Spivack, M. R. Fisk, S. A. Haveman, H. Staudigel, and Ocean Drilling Program Leg 185 Shipboard Scientific Party. 2000. Tracerbased estimates of drilling-induced microbial contamination of deep-sea crust. Geomicrobiol. J. 17:207–219. 26. Summit, M., and J. A. Baross. 2001. A novel microbial habitat in the midocean ridge subseafloor. Proc. Natl. Acad. Sci. USA 98:2158–2163. 27. Summit, M., A. Peacock, D. Ringelberg, D. C. White, and J. A. Baross. 2000. Phospholipid fatty acid-derived microbial biomass and community dynamics in hot, hydrothermally influenced sediments from Middle Valley, Juan De Fuca Ridge. Proc. Ocean Drill. Prog. Sci. Results 169:1–19. [Online. ]http: //www-odp.tamu.edu/publications/169_SR/VOLUME/CHAPTERS/SR169 _03.PDF. 28. Sunna, A., S. Tokajian, J. Burghardt, F. Rainey, G. Antranikian, and F. Hashwa. 1997. Identification of Bacillus kaustophilus, Bacillus thermocatenulatus, and Bacillus strain HSP as members of Bacillus thermoleovorans. Syst. Appl. Microbiol. 20:232–237. 29. Takai, K., and K. Horikoshi. 1999. Genetic diversity of archaea in deep-sea hydrothermal vent environments. Genetics 152:1285–1297. 30. Takai, K., T. Komatsu, F. Inagaki, and K. Horikoshi. 2001. Distribution of archaea in a black smoker chimney structure. Appl. Environ. Microbiol. 67:3618–3629. 31. Vrede, K., M. Heldal, S. Norland, and G. Bratbak. 2002. Elemental composition (C, N, P) and cell volume of exponentially growing and nutrientlimited bacterioplankton. Appl. Environ. Microbiol. 68:2965–2971. 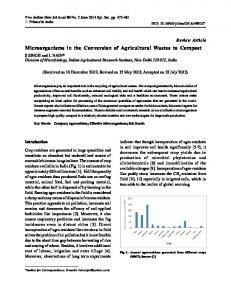 Report "Distribution of Microorganisms in the Subsurface of the Manus Basin ..."